This ad is wonderful. They manage to take every, quite considerable, fault of this watch and turn it into a feature. Because of the giant solar panel that covers the face of the watch you get the “Natural Side-View Window lets you tell the time, day, and date without twisting your arm into an obvious, awkward position.”. Then there is the amazing 1 second per month accuracy. All you have to do us use the incredibly simple mode #4 to set your programmable speed calibration and leap year settings. This of course gives you the power to calibrate your watch for any local climactic or magnetic conditions. I don’t know about you, but my watch always runs a little fast when it’s snowing outside. The only “PURE-SOLAR” timepiece in existence. Guaranteed to outperform any watch sold today…or costs you nothing! The Sunwatch… never needs batteries… accurate to within 1 second per month…virtually Indestructible, beautifully styled sport/dress watch. An engineering/design breakthrough In space-age timekeeping technology…that now makes all other watches obsolete: ¦ 100% sun-powered, no batteries that need replacing. Clearly visible by day or night. ¦ Unique side-window view, simplifies reading. ¦ Built-in computer calendar – no need to ever re-set the watch (Not even in 31 -day months and leap years!) ¦ Unprecedented accuracy – you program the Sunwatch’s computer to stay accurate within 1 -second per month! A “State-Of-The-Art” timepiece that combines solar age energy efficiency with a unique feeling of futuristic elegance and beauty. 10 years ago the Sunwatch was an idea, years ahead of its time, on the drawing board of Roger Riehl, a noted expert in solar energy, integrated circuitry, and computer chip technology. As a result of these years of costly and extensive research, Mr. Riehl’s dream of a perfect watch has been realized, and this is now available through the Starshine Group, a California-based marketing organization specializing in unique, innovative products. 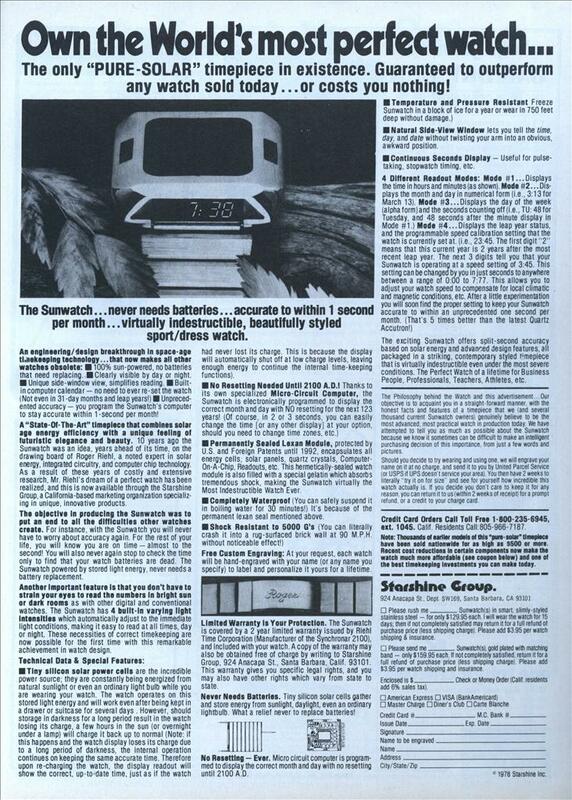 The objective In producing the Sunwatch was to put an end to all the difficulties other watches create. For instance, with the Sunwatch you will never have to worry about accuracy again. For the rest of your life, you will know you are on time-almost to the second! You will also never again stop to check the time only to find that your watch batteries are dead. The Sunwatch powered by stored light energy, never needs a battery replacement. Another Important feature Is that you don’t have to strain your eyes to read the numbers In bright sun or dark rooms as with other digital and conventional watches. The Sunwatch has 4 built-in varying light Intensities which automatically adjust to the immediate light conditions, making it easy to read at all times, day or night. These necessities of correct timekeeping are now possible for the first time with this remarkable achievement in watch design. 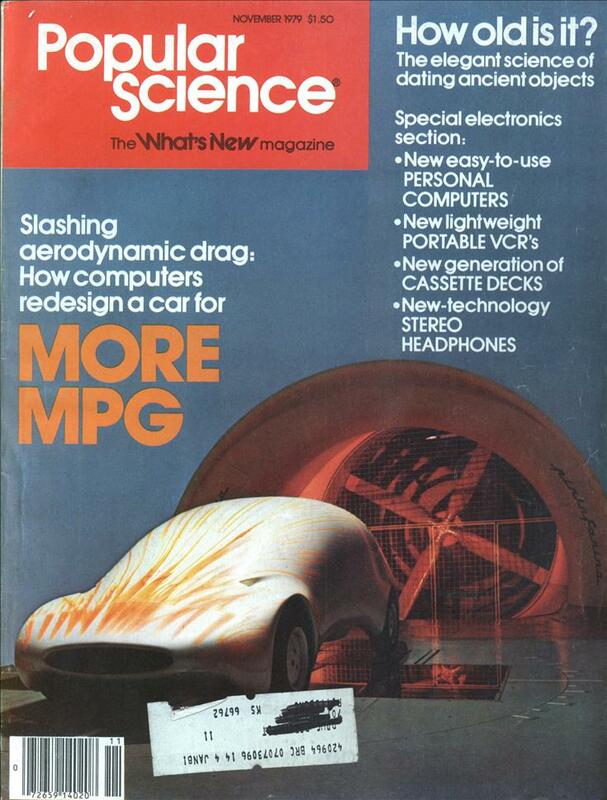 Technical Data & Special Features: had never lost its charge. This is because the display will automatically shut off at low charge levels, leaving enough energy to continue the internal time-keeping functions). No Resetting Needed Until 2100 A.D.! Thanks to its own specialized Micro-Circuit Computer, the Sunwatch is electronically programmed to display the correct month and day with NO resetting for the next 123 years! (Of course, in 2 or 3 seconds, you can easily change the time [or any other display] at your option, should you need to change time zones, etc. Permanently Sealed Lexan Module, protected by U.S. and Foreign Patents until 1992, encapsulates all energy cells, solar panels, quartz crystals, Computer-On-A-Chip, Readouts, etc, This hermetically-sealed watch module is also filled with a special gelatin which absorbs tremendous shock, making the Sunwatch virtually the Most Indestructible Watch Ever. Completely Waterproof (You can safely suspend it in boiling water for 30 minutes!) It’s because of the permanent lexan seal mentioned above. Shock Resistant to 5000 G’s (You can literally crash it into a rug-surfaced brick wall at 90 M.P.H. without noticeable effect!) Free Custom Engraving: At your request, each watch will be hand-engraved with your name (or any name you specify) to label and personalize it yours for a lifetime. Tiny silicon solar power cells are the incredible power source; they are constantly being energized from natural sunlight or even an ordinary light bulb while you are wearing your watch. The watch operates on this stored light energy and will work even after being kept in a drawer or suitcase for several days. However, should storage in darkness for a long period result in the watch losing its charge, a few hours in the sun (or overnight under a lamp) will charge it back up to normal (Note: if this happens and the watch display loses its charge due to a long period of darkness, the internal operation continues on keeping the same accurate time. Therefore upon re-charging the watch, the display readout will show the correct, up-to-date time, just as if the watch Limited Warranty Is Your Protection. The Sunwatch is covered by a 2 year limited warranty issued by Riehl Time Corporation (Manufacturer of the Synchronar 2100), and included with your watch. A copy of the warranty may also be obtained free of charge by writing to Starshine Group, 924 Anacapa St., Santa Barbara, Calif, 93101. This warranty gives you specific legal rights, and you may also have other rights which vary from state to state. Never Needs Batteries. Tiny silicon solar cells gather and store energy from sunlight, daylight, even an ordinary lightbulb. What a relief never to replace batteries! No Resetting – Ever. Micro circuit computer is programmed to display the correct month and day with no resetting until 2100 A.D. Temperature and Pressure Resistant Freeze Sunwatch in a block of ice for a year or wear in 750 feet deep without damage.) Natural Side-View Window lets you tell the time, day, and date without twisting your arm into an obvious, awkward position. Continuous Seconds Display – Useful for pulse-taking, stopwatch timing, etc. 4 Different Readout Modes: Mode #1 …Displays the time in hours and minutes (as shown). Mode #2… Displays the month and day in numerical form (i.e., 3:13 for March 13). Mode #3…Displays the day of the week (alpha form and the seconds counting off (i.e., TU: 48 for Tuesday, and 48 seconds after the minute display in Mode #1.) Mode #4…Displays the leap year status, and the programmable speed calibration setting that the watch is currently set at, (i.e., 23:45. The first digit “2” means that this current year is 2 years after the most recent leap year. The next 3 digits tell you that your Sunwatch is operating at a speed setting of 3:45. This setting can be changed by you in just seconds to anywhere between a range of 0:00 to 7:77. This allows you to adjust your watch speed to compensate for local climatic and magnetic conditions, etc. After a little experimentation you will soon find the proper setting to keep your Sunwatch accurate to within an unprecedented one second per month. (That’s 5 times better than the latest Quartz Accutron!) The exciting Sunwatch offers split-second accuracy based on solar energy and advanced design features, all packaged in a striking, contemporary styled timepiece that is virtually indestructible even under the most severe conditions. The Perfect Watch of a lifetime for Business People, Professionals, Teachers, Athletes, etc. The Philosophy behind the Watch and this advertisement…Our objective is to acquaint you in a straightforward manner, with the honest facts and features of a timepiece that we (and several thousand current Sunwatch owners) genuinely believe to be the most advanced, most practical watch in production today. We have attempted to tell you as much as possible about the Sunwatch because we know it sometimes can be difficult to make an intelligent purchasing decision of this importance, from just a few words and pictures. Should you decide to try wearing and using one, we will engrave your name on it at no charge, and send it to you by United Parcel Service (or USPS if UPS doesn’t service your area). You then have 2 weeks to literally “try it on for size” and see for yourself how incredible this watch actually is. If you decide you don’t care to keep it tor any reason, you can return it to us (within 2 weeks of receipt) for a prompt refund, or a credit to your charge card. Credit Card Orders Call Toll Free 1-800 235-6945, ext. 1045. Calif. Residents Call:805-966-7187. Note: Thousands of earlier this “pure-solar” timepiece have been sold nationwide for as high as $500 or more. Recent cost reductions In certain components now make the watch much more affordable (see coupon below) and one of the best timekeeping Investments you can make today. Starshine Group 924 Anacapa St, Dept SW169, Santa Barbara, OA 93101 ? Please rush me_Sunwatch(s) in smart, slimly-styled stainless steel – for only $129.95 each. I will wear the watch for 15 days; then if not completely satisfied may return it tor a full refund of purchase price (less shipping charge) Please add $3.95 per watch shipping & insurance. Please send me Sunwatch(s), gold plated with matching band – only $ 159.95 each. If not completely satisfied, return it for a full refund of purchase price (less shipping charge). Please add $3.95 per watch shipping and insurance. Looks like a fax machine, and ONLY $159.95! I wonder how many watches they sold. “You can safely suspend it in boiling water for 30 minutes!” I have been looking for a watch like that for years! I don’t remember this safety feature on brick walls in 1979? Doesn’t need resetting til 2100?? It’s Y2K compliant? Really!? someone who can do it. I purchase one in 1979. I got the silver as I could not aford the gold version. Had it for 3 days and the magnetic switch failed, so I could not use it. Sent it back for repairs and never seen it since. Cool watch, I wonder if they are still around today. Short answer to your question is no.